2. He’s a virulently antigay bigot. Kobach uses divisive politics and has grouped gays and lesbians together with pedophiles. During his 2004 run for Congress, Kobach accused the Human Rights Campaign of promoting “homosexual pedophilia” in an attempt to smear him. 3. He’s a birther. In his bid for Kansas secretary of State, Kobach raised the question of whether President Barack Obama’s short-form birth certificate was sufficient to prove his citizenship. Later, when called on it, Kobach backtracked and said that he believed in the president’s citizenship but still maintained that questioning his birth certificate was valid. 4. He’s a self-serving opportunist. When Kobach takes his anti-immigrant show on the road, he makes a pile of money representing local communities, often running up huge bills. Kobach co-wrote anti-immigrant laws across the country, from Farmer’s Branch, Texas; to Fremont, Nebraska; to Prince William County, Virginia; to Hazelton, Pennsylvania; to Valley Park, Missouri; to Arizona; and Alabama. Kobach’s efforts have netted him more than $6.6 million in legal fees. And while serving as secretary of state in Kansas, Kobach appeared on out-of-state media at least 101 times in just one year, with an astonishing 31 appearances just on Lou Dobbs’ shows. 5. He’s antidemocracy. 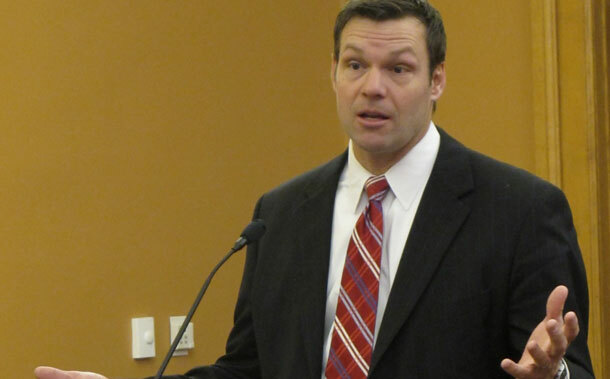 Kobach ran for Kansas chief elections officer on a flimsy voter fraud platform. Using nonexistent cases of alleged voter fraud as an excuse, Kobach pushed a law that will disenfranchise thousands of Kansans. He claimed that his voter ID law does not suppress the vote of citizens, and especially minority citizens, when in reality the opposite is true. After getting this law passed, Kobach did not take the steps necessary to make it possible for citizens who lacked an ID to get one for free, as the law required. This is no doubt one reason that Kobach’s approval rating among Kansans is in the tank at 32 percent. This is the man behind Arizona’s S.B. 1070. He’s an opportunist earning millions of dollars while working for a racist hate group, which gives him a platform on hate TV and radio shows to peddle his reactionary vision for America. The next time similarly anti-immigrant legislation surfaces in state legislatures across our nation, see if Kris Kobach is behind the effort. Then you will know the real intent of the proposed law. Anh Phan is the Anti-Hate Table Manager at the Center for American Progress.